When I clicked publish on my first official post in May 2012, I don't know where I thought (or hoped) this blog would be in four years. I started it as an outlet for my reading passion. I wanted to be able to keep a record of the books I'd read, and I wanted to be able to connect with other readers. But besides the book reviews, I also wanted to capture how our family felt about books and reading and life in general. I never wanted it to become a family journal where I documented every activity (and I don't think it has), but I also didn't want to separate my actual life from the book reviews. I wanted this blog to be me, and I feel like I've stayed true to that original vision over the last four years. 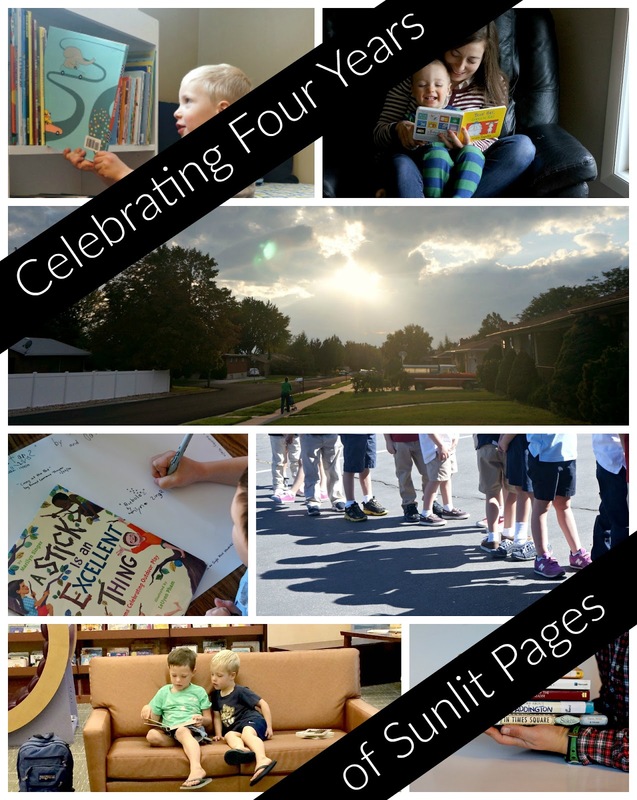 A lot of bloggers recap their blog's highlights at the end of the year, but I prefer to do it in May when Sunlit Pages turns another year older. I hope you'll indulge me as I reflect back on some of the changes and additions that have happened over the last year and also remember a few favorite posts. It got a major redesign last summer. My friend, Sarah, helped me with the new template. And my friend, Molly, drew the picture for the header. I still smile every time I open up this page and see all of us sitting under that tree because it reflects my ideal even if that's not what reading looks like for us all the time. I conducted my first official survey. I was so happy so many of you chose to take it, and the information was very helpful. I took a three-week break. On purpose and with intention. It was so good for me and helped me realize that I still like blogging. However, I continue to search for the perfect balance between blogging and mothering and my other interests and responsibilities. You may have noticed that I've been averaging two posts a week instead of three lately. I think that's just the season of life I'm in lately, and I'm working on being okay with it. I opened up my Raising Readers series to guest writers, and it's been so fun to see how other families encourage a love of books and reading in their homes. Suzanne and I started a monthly(ish) blab, which we appropriately christened, The Book Blab. Although we record it live (and always let our readers know when that will happen), we always post the videos with the show notes after we're done so anyone can watch them at anytime. Episode 6 will air later this week (Thursday, May 26th, at 7:00pm MST). I became an Amazon affiliate. Now if you click through one of the links into Amazon and then purchase something (anything! ), I'll make a small commission. I started giving monthly family updates. I actually love putting together these posts, and even though they usually don't have too much to do with reading, I love summing up the big and little happenings in one post. I was a Cybils judge for the easy readers and early chapter books category. This was one of the most fun and rewarding things I did this year, and I'm hoping to participate again next year. I don't foresee any big changes for this upcoming year. I'm hoping to return to more frequent picture book posts (I've let Instagram take over for me there (#kidpages for all of my recommendations), but I like writing longer reviews sometimes). Also, I haven't kept my archived lists of book reviews very up-to-date, and I'm hoping to do much better with that this year. Is there anything you'd particularly like to see more of in future posts? It's hard to see some of my favorite posts get lost in the archives, and so every year I try to resurrect just a few of them by highlighting them here. Hopefully you discover some that you haven't read before! And finally, to celebrate Sunlit Pages' fourth birthday, I'm giving away one copy of Little Men in the Puffin Classics edition. This was one of my favorite books in 2015, and then, just a few weeks ago, I found it in this darling edition (that inspired me to write this post). Thanks for another great year of talking books and other things! I love reading your insights and recommendations in the comments or through email. There's nothing quite like connecting with other people who have that same passion for reading. Cheers! Update: Congratulations to Jen Robinson who won the giveaway! Jen has been a reader here for many years and runs a wonderful blog herself. Go check it out! Congratulations Amy! You are an inspiration not only with your dedication to this blog but with the myriad other things you showcase here - your absolute passion for books, your creative and dedicated mothering, your thoughtful approach to decisions big and small, and your open and humble heart. Keep up the great work, it is appreciated! Happy blog birthday, Amy! I'm so glad that you are here. Hope that the coming blogging year is a satisfying one for you. I do love reading your blog and yes how you entwine book reviews with family snippets and reactions to books. You probably have a post in the works but I'd be curious to hear about how it's going with a new Kindle and your big trip's location (your NZ trip looked awesome!). And I will definitely be sharing details of our upcoming trip! I'm equal parts excited and nervous for it! Pick me! Love this post and all the awesome things you've accomplished through this blog. It's inspiring!! We've found so many new books to adopt and love because of your Instagram posts and blog! Congratulations on four years! I'd say it's a success 😀. We have found many books from your suggestions. I really like all your reviews! Happy Blog Anniversary. Love reading your posts! Congratulations on 4 years! Love Little Men. Great choice! Congratulations on 4 years of inspiring and informing your readers! I am am elementary teacher and often use your suggestions and reviews when selecting books for my classroom...thank you! Congrats! Your blog is darling! Congrats on celebrating four years of blogging, Amy! I've loved reading your book reviews and your other fun, interesting, thought-provoking posts over the years and I'm so glad to have made the connection with a fellow book lover and mom of four! :) Thanks for the chance to win a copy of Little Men! Happy 4th! I enjoy your blog very much! Missed the deadline for the giveaway, I see, but I just wanted to say congrats and I love your blog! Thank you to everyone who participated in the giveaway and for your kind comments! It's so great talking books with you!! !